A fully-done crossword puzzle is on the table next to Chitra Subbaiah who confesses that she could forego reading the newspaper, but not the crossword. We are in the cottage of a home-stay in Madapura, north Coorg, resplendent in the evening sun—the first day in two months that the rain has let up. It brings some rel­ief from fear. 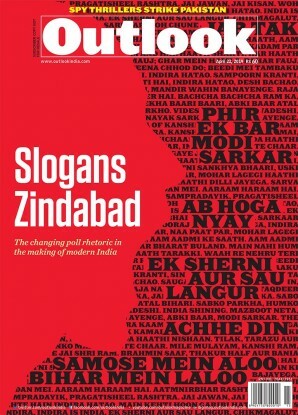 Chitra, nearing eighty, rec­ounts a painful experience with great fortitude. “You have to do some mental jugglery, you know. You can’t curse your fate.” She’s staying in a friend’s cottage because her home, in the neighbouring village of Hattihole, now lies beneath a pile of earth which slid down the hillside, burying everything she owned. “Wiped out, totally. I don’t have one pin. There is nothing to say there was a house,” she tells Outlook. All she could reach out for in time were her spectacles, medicines and some gold the wor­kers from her coffee estate had ent­­r­­usted her with safekeeping. The workers’ quarters on her coffee estate too went down. Fortuna­tely, they had time to move out. She points to others in the same situation. “At least I can rent a house and stay. What about so many others, who have nothing,” she asks. Before the rains started this year, coffee planters in Coorg were talking of a good crop—the plants were well rested after a lean year and went through the process of blossoming and forming fruits. That settled, seasonal certainty is gone with the wind and merciless lashings of torrential rain. It rained heavily through July and August in this region of south Karnataka bordering Kerala. Then, in late August, came a series of punishing cascades of sodden earth. Now, there’s a trail of ruin in these charming hills, where landslides have swept off whole villages, re-arranged estates and shattered its economy. With immediate rescue measures tapering off, one question hangs limply in the air: where do you start picking up the pieces? Landslides have swept off villages and shattered the economy. About 5,000 to 7,000 acres have been wiped off. “I can’t plant anything now on my land, that’s for sure,” says K.U. Erappa, standing in his camouflage gumboots in a relief camp inside Madikeri’s old fort where, grouped with several families, he has been staying for days now. “All that’s left of my coffee plants are just stalks,” Erappa says. His ageing mother walks up to say, “We had a small house, but it was pretty.” Their grief is palpable. Erappa owned a few acres of coffee and paddy in Mukkodlu, one of the hardest-hit places in north Coorg, in the vicinity of district capital Madikeri. Much of Coorg is remote, away from the main-travelled roads. Like others, Era­ppa has been going back to salvage what he could. His three children, like most kids from his village, have been sent away to a temporary residential facility in a school in Ponnampet town at the southern end of the district. “We never dreamt Coorg would come to this,” says N. Bose Mandanna, a planter from Suntikoppa. Right now, a full picture of the damage isn’t available, though it is being estimated. 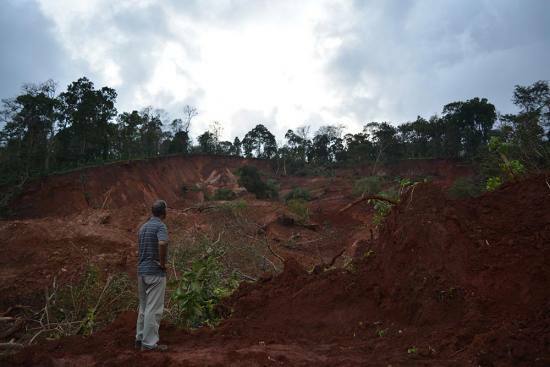 Planters like Mandanna reckon that at least 5,000-7,000 acres have been wiped off in the landslides. For the plants still standing, there’s the danger of wet feet and black rot—water-­logging at the base of the plant that strangulates it, cau­sing leaves to fall off. “When leaves are lost, next year’s crop is also lost,” says Man­danna. Coorg, with about one lakh hectares in cultivation, accounts for close to 40 per cent of India’s coffee production. The 2017-18 post-blossom estimate was 1,33,500 metric tonnes, most of which is exported, Italy being a top destination. To make matters worse, prices, say market watchers, have been at historic lows. Brazil is harvesting a good crop this year and so will Columbia and Vietnam. “International prices have gone (down) to levels last seen in 2006. We are getting a lot less now, if you factor in the inflation,” says Ramesh Rajah, president of the Coffee Exporters Asso­ci­ation. Prices dep­end on the big three producers—Brazil, Columbia and Vietnam—which account for over 70 per cent of the global production. “Only if there are supply shocks in the big three will there be impact in international prices. India can lose one third or even half its production and the international market is not going to blink,” says Rajah. For those who lost land, verifying claims and boundaries is a big task. For others, replanting is a burden. In the mid-nineties, Coorg coffee saw a boom when prices rose because of a supply shortage in Brazil whose production, apart from being vulnerable to frost, was considered inefficient then. The boom years lasted a decade until trends began to reverse. Owing to hilly terrain, Coorg can’t mechanise the way Brazil did. So, it has been grappling with high labour costs. Nor can other crops be sown, as coffee plants need trees for shade. Many Kod­a­vas, as Coorg’s natives are called, conc­ede the difficulty in maintaining pla­­­­n­­tations. The symptoms, many say, have been showing—an ageing population, a you­nger generation that has been migrating to cities and bits of land being sold to meet expenses, the latter contributing to a soc­ial churn in the highlands. This devastating blow came on top of all this. The future, many say, is bleak. First, the question of land lost, by no means an easy task, given the complexities that involve verifying claims, boundaries and so on. “Let the government acquire the property. See the record, set­tle them,” says planter Mittu Che­n­gappa, who’s also a Karnataka Congress general secretary. His suggestion, that the government acquire private land ravaged by landslides for afforestation so that owners can begin afresh elsewhere, has been voiced by many. Unlike neighbouring Chikmagalur—where coffee was first grown in India—there are more small growers in Coorg, many owning only a few acres. Even for those who didn’t lose land, rep­lanting will be a big financial burden, says Rajah. Besides the upfront cost, it would mean a five-year wait for yields. “So, how will they sustain themselves for five years? What does he do about infrastructure within the farm, workers’ houses, his house?” asks Rajah. Coffee planters have always weathered difficult years, but the destruction this year is unprecedented. “Some years, the crop yield is sharply lower because of lack of rain or excess rain. But this is the first time we have act­ually seen this sort of damage where infrastructure is damaged. It’s going to be very difficult in the short term,” reckons Rajah. In the long term, he says, every producing country is bleeding, so things can be pulled back to a degree by increasing efficiency. Of course, primary rehabilitation remains a priority; the process of replanting will take place slowly. “The other thing is the labourers are not coming back. We are still in a state of flux, a dilemma as to what’s going to happen. There are a lot of issues, it’s very fluid,” says Nanda Belliappa, a coffee grower from Hattihole who has to now walk half a kilometre inside his property to reach his house, as the road leading to it is blocked. The Hatti, a stream outside his gate—where once a Malayalam film was shot—has beached fallen tree trunks ashore. “The neighbours’ coffee plants and trees are on our road...it’s unbelievable,” says his wife Anitha. In villages in these parts, the conversations go from rain to earthqu­ake—many planters say they heard loud booms and felt tremors, but officials say no seismic event was captured.